Unless it’s for taking out the dog or for jogging, Brazilians do not walk; they drive. For one, it’s because badly done sidewalks are another similarity between Brazil and Belgium Brussels. For the other, it might be because the only poor devils walking are those who cannot afford a car. Or because driving is considered safer; i.e. it’s harder to rob a driving car than a pedestrian; though that certainly is not taking road safety into account. Anyway, contrary to other cities in the world, I get to enjoy a relaxed walk to the bus station or to the next popular square without dodging fellow pedestrians, strollers or dogs, while only occasionally stumbling over roots or rocks. 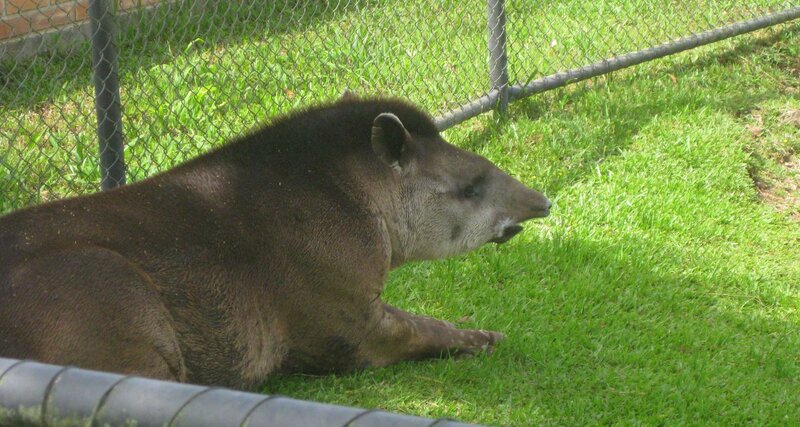 Tapirs, in Portuguese called Anta, do not enjoy much respect or a high reputation in Brazil. On the contrary, to call someone “uma anta” equals to denying this particular person even the most basic intelligible reasoning. Maybe that’s why tapirs are threatened. In a mundus humanus, not being a cute animal hardly helps conservation. I kind of like them. They are peaceful, slow vegetarians and like to take a swim. Plus, the little ones are cute. Don’t you think? For me, the zoo of Curitiba would not need to star any lions, tigers or giraffes, the South American fauna would be more than enough. I mean: harpy eagles, giant anteaters, giant otters, rheas? With or without the imported species, the zoo is an excellent area to spend a Saturday afternoon, preferably before 15:00 as this is the time when most Brazilians will come from their extended lunch.